Memory Wars is the theme of the twentieth annual Divided Societies course for PhD students and other postgrads in the Inter-University Centre in Dubrovnik this year. The course runs from 7-14 May 2017 and the fee is a modest 50 euro. There are regular direct flights from Dublin to Dubrovnik (for those traveling from Ireland) and there is plenty of hostel accommodation in the city for those on a limited budget. Key speakers include Professor Siniša Malešević (UCD). Full details below. During the Cold War the Inter-University Centre was a meeting place for scientists and scholars from east and west and its first director was the pioneering scholar of peace and conflict studies, Johan Galtung. After the violent break-up of Yugoslavia in the 1990s a group of academics came together to establish a course on divided societies at the IUC. The IUC is just a few minutes walk from the spectacularly beautiful walled city of Dubrovnik. 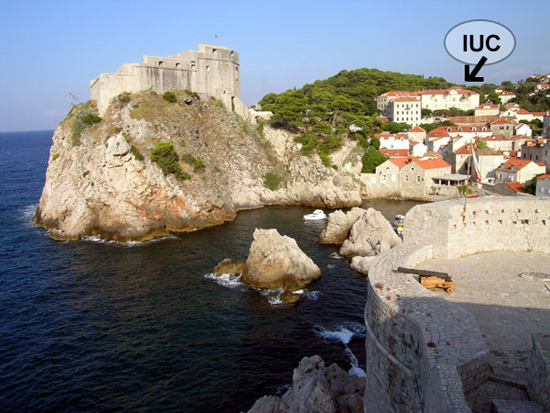 Game of Thrones fans will notice that the IUC is very close to a number of familiar ‘King’s Landing’ filming locations. If you are interested in attending please contact the IUC (details below) but feel free to also email me at niall.odochartaigh[at]nuigalway.ie and let me know. I am a co-director of the course and will try to answer any queries you may have. The legacy of violent conflict is at the forefront of contemporary politics in many divided societies where struggles over the past contribute to the regular renewal of tension. On its twentieth anniversary the Divided Societies course examines the memory wars that have become an increasingly important focus of contention in recent decades. It pays particular attention to the Balkans, Northern Ireland and Israel/Palestine, three regions where conflict seemed to have been resolved by peace settlements in the early 1990s but where the past continues to contribute to crises in the present. Struggles over the past were somewhat neglected by the founders of the social sciences, concerned as they were to understand the rupture with the past in the modern era. But the growing reflexivity of the modern age was manifested in part in a search for historical foundations, and the proliferation of commemorative rituals. Since the 1980s there has been a rapid growth in academic analysis of the uses of the past and social memory. The growth of new technologies for information storage and retrieval has given added urgency and importance to the question. If modernity brought intensified reflection on the past, the information age is accompanied by a merging of past and present that helps to prolong the afterlife of conflicts. New technologies provide easy access to primary historical sources, facilitate the proliferation of commemorative discourses and help to keep the past constantly to the fore in contemporary debate. The effect is reinforced by new forensic technologies that allow prosecutions for decades-old actions and make it much more difficult to consign previous conflicts to a separate realm called ‘the past’. The course examines memory as a resource for political mobilisation and as a source of power and legitimation. It analyses commemoration as a site for the temporal and spatial concentration of struggles over the past and discusses legal approaches to dealing with the past. It looks too at alternative historical mechanisms for dealing with the past. We encourage the participation of students and scholars in the social sciences, law and humanities and other fields and disciplines studying social phenomena such as divisions, cleavages, conflicts, borders, ethnicity and diversity. The course provides a rigorous interdisciplinary academic programme structured around lectures, workshops and conference-oriented presentations of scholarly research. Course participants will engage in active discussions on the theoretical, methodological and practical issues of research in divided societies. Graduate and postgraduate students’ presentations are also welcome. In addition, the course offers a personal inter-cultural experience of students and faculty from other contexts in the unforgettable setting of a city that was itself the target of a destructive conflict. The course offers ECTS credits for PhD and MA students (3-5 ECTS).